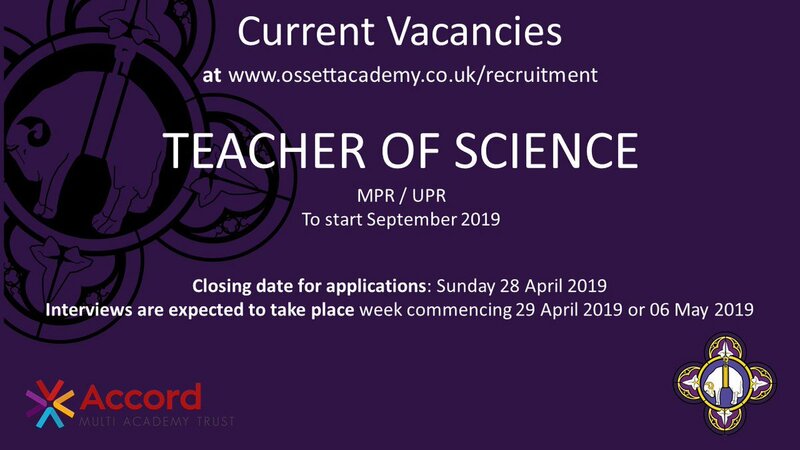 The Science Department consists of thirteen members of staff with a variety of industrial experience and Science qualifications who are supported by two technicians. The Science Department aims to ensure that students access a broad and balanced Science curriculum where they derive interest, enjoyment and a sense of achievement from their studies. Our aim is to nurture students to develop an inquiring, inquisitive mind and learn the skills required of a scientist such as working with a scientific method of approach. We actively promote an appreciation of the importance of Science, and its application in a rapidly changing technical world. To extend students’ experience of Science there are opportunities to be involved in Fab Lab (science club) which involves a range of activities including forensics, and STEM club. Educational trips and visits are organised throughout the year to further enhance student’s learning. Students receive three one-hour lessons per week in Key Stage 3 with a variety of teachers covering the three disciplines of Biology, Chemistry and Physics. Students follow the national curriculum in a two year KS3 program. In Year 7, topics such as Cells, Reproduction, Particle Theory Acids and Alkalis, Forces and Energy build up and expand on the knowledge students have developed through Key Stage 2. In Year 8, topics include Healthy Diet, Microbes and Disease, Earth Structure, Metals and their Properties, Light and Sound and Energy Transfers. An integral part of the course is to allow students to develop their hands-on skills through practical lessons and investigations. Enquiring minds are at the heart of Science and the Science Department strives to encourage this skill at Key Stage 3. Students will start their GCSE courses in Year 9. They will receive four or six lesson per week split between the three disciplines. Students may be taught by a specialist for that particular Science. The course followed is the AQA Biology, Chemistry or Physics (Separates) or GCSE Combined Science (Trilogy). Students will be examined on the content of this course in Year 11 and there will be a review of the topics covered in this year throughout the rest of KS4. Additionally, within each Science at KS4 there are required practicals which have replaced the coursework. Students will cover these as they fit into the program of study with the skills they target forming 15% of the final examination content. Students are regularly assessed and homework is set on a weekly basis. Marking is vital to progress and students will be expected to act on any feedback provided by teaching staff. Year 10 students are now on a pathway leading to 2 or 3 GCSE’s and these are a continuation of the work started in year 9. All students start on a pathway where they study separate GCSE’s in Biology, Chemistry and Physics. The curriculum is delivered in 4 lessons a week with exams covering work taught in year 9 and year 10. All exams must now be taken at the end of Year 11. There are no early entries in year 10. The exams will be in May/June 2020. (The timetable is not published until February 2019) and every student will sit 2 exams for each GCSE so will have a total of 6 exams. There is no coursework. As with year 9, this has been replaced by required practicals which will be undertaken throughout the 3 years of study and questions will be integral to the final exams papers. On the 3 GCSE pathway, examinations are 1 hour 45 minutes in duration and each exam is worth 50% of the final GCSE. Students can take Higher tier papers or Foundation tier papers and the questions are varied in structure including multiple choice, structured, closed short answer and open response. Each individual science leads to one GCSE. On the 2 GCSE pathway, examinations are 1 hour 15 minutes in duration with each paper being worth 16.6% of the final grade. The qualification grained leads to a combined double grade for Science Trilogy. Year 11 mirror the format of year 10 and students have been placed on the most appropriate pathway for their needs. Therefore they will be studying for either Separate Biology, Chemistry and Physics 9-1 qualifications, or a combined grade for Trilogy. Our aim at Ossett Academy is to ensure that all students have had the opportunity to develop and enhance their interest in science in order that they can make more informed decisions and choices about what is important in the ever growing world of science and technology. The list is endless for the careers where Science would be required, whether it is further study, apprenticeships or direct employment. It is important to not just think of the usual Science careers, but to think more of Science as an essential part of education leading students on into any career path they would chose. The courses students follow will influence their progression on the next step from GCSE. All students will be able to progress into KS5 Science subjects whether they are on the Separates of the Combined route. Science is an essential part of any career as it allows students to explain the world around them, develop an enquiring mind, to have a hands-on approach to solving problems and cultivate logical thinking. These skills are transferrable to many other post GCSE courses and careers. The AQA website for past papers is a useful resource although for KS4, due to this being a new specification, papers are limited at the moment. The AQA website also has the specifications for the content required. BBC Bitesize GCSE Science has been updated to include the new content. Any Science revision guide that contains the courses for examination from 2018 is appropriate for KS4. CGP seems to be the most user friendly and these can be purchased from the Academy. Intervention sessions are hosted by members of the Science team, but attendance in lessons is key to success with complimentary studies outside of the classroom at home. We hope that you will encourage your child to extend their knowledge and understanding by reading books at home and by watching popular science programmes on television and making effective use of the academy’s resources.